Technical problems have blighted parts of the BBC's online service over the weekend and have persisted into Monday. The problems have particularly affected the main BBC homepage, which has been reduced to running a simplified version and the iPlayer has been inaccessible or producing error messages for some online and digital TV viewers. This has delayed the publishing of some programmes on the catch-up service. Audio catch-up and streaming service iPlayer Radio has also been affected. Over the weekend, Virgin TiVo users lost access to BBC programming on catch-up, as well as Connected Red Button services. The BBC Press Office advised that they were aware of a problem, but a reason for the issues, which were first reported on Saturday morning, has not been disclosed. The BBC is assuring users that the problems will be fixed today and will issue a statement when it has identified the cause of the problems. 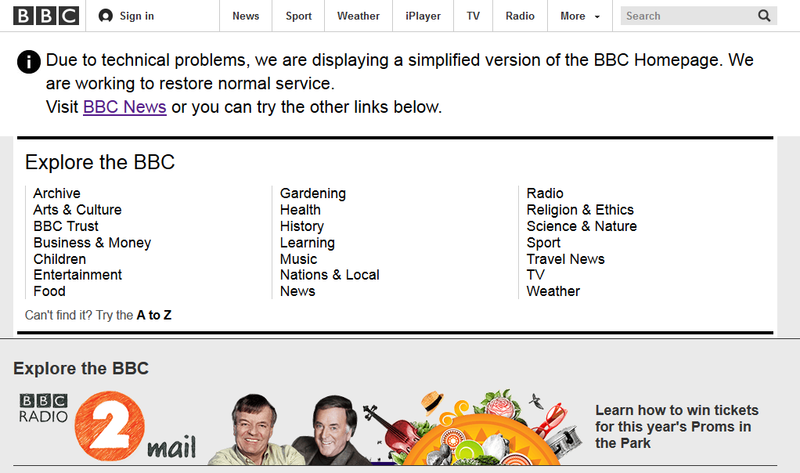 The BBC has confirmed that its homepage is now up and running again.